Although it’s far from being a class leader, the Vauxhall Astra Sports Tourer Estate is a practical and affordable choice for families who are looking for a new car. It’s a promising vehicle, too, and is the best it’s ever been. It’s shed some unnecessary weight, has more style, and is more engaging to drive. It also comes with more efficient engines, and bags of equipment, and can offer you and your family plenty of space. It is up against some top quality rivals, though, including the Volkswagen Golf Estate. OSV takes a closer look at what it’s got to offer you with our Vauxhall Astra Sports Tourer Estate review. This Estate isn’t really suited to twisting roads, and it’s not as much fun to drive as the Ford Focus Estate. But get it out on the motorway, and you’ll have quite the comfortable cruiser on your hands. Exterior noise is kept to a minimum, though if you pair it up with larger alloys, you might find that the ride becomes less pleasant. Overall, though, this is an enjoyable car to drive. The grip is nice and strong, and the controls are well weighted. It isn’t much fun, and it doesn’t immerse you in the driving experience, but it would be unfair to judge it too harshly when you consider the price and how comfortable it is. Moreover, if you go for the SRi model, you get a different suspension setup that improves handling responsiveness. There is no high-performance VXR model on offer, so this is as good as things get. And it isn’t too shabby. This Estate and the hatch from which it’s derived share a lot of things in common, but the petrol line-up is not one of them. Whereas the hatch offers a very convincing and a very performative 1.4-litre turbocharged power plant, the same engine is conspicuous by its absence from the range here. Quite why, we’re not sure. Dismally, you’re instead limited to a 1.4-litre 98bhp and a 1.6-litre 113bhp. Both are unremarkable – if competent – units that need to be worked hard. The pick of the diesel units, meanwhile, is the 1.6-litre 108bhp offering. Although there are beefier engines in the diesel squad (including the 2.0-litre unit), the 1.6 gets you up to speed quickly and is also the most frugal in the line-up. All the diesels can be quite noisy, though, which does mean that whichever engine you choose, you will have some issue, especially on lengthier trips. Vauxhall is up against some very good rivals in this sector whose cars have plush, well-built interiors. The Astra Sports Tourer largely delivers the goods inside, too, although standard kit is a bit disappointing. The Astra Estate is solidly built and sports a cabin that is of pleasingly high quality. Fit and finish is good, and comfort is right up there among the best in class. The drivers seat is adjustable, as is the steering wheel, and as such it won’t take you two minutes to get comfy. The seats are supportive and make lengthier trips hassle free. The centre console, however, is a bit of a letdown. There is nothing wrong with the main controls themselves, but quite what possessed Vauxhall to include so many buttons is anyone’s guess. We reckon this is something that will be changed when the car is revised because the dash looks far too busy and therefore off-putting. There’s just too much action going on behind the steering wheel. There is at least one positive caveat, which is that you can operate the features with the vehicle’s multifunction steering wheel. In terms of practicality, the Sports Tourer Estate scores quite well. The boot has a big, boxy shape that makes for easy loading, although measuring at 500-litres it’s far from being the biggest in the class. It is, however, bigger than the one in the Vauxhall Insignia Estate, and will be enough for some of you. Space in the back isn’t class-leading either, and taller adults might be pinched for space. 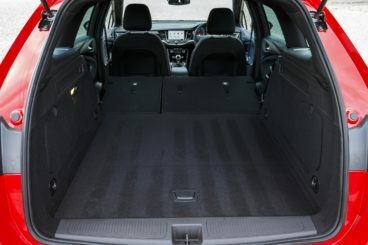 The rear seats do fold down completely, though, which allows you to extend the boot to 1,550-litres. The doors open wide, which makes for easy access, although it’s a shame that the central rear seat is missing mounting points for you to attach a child’s seat. There are more storage spaces than in the hatch, including pockets on the back of the two front seats. Head and legroom is good up front. Vauxhall have surprisingly marketed this car as more upmarket than past Astra Estate’s, and we raise our eyebrows because an upmarket Estate really should do better when it comes to standard equipment. It’s decidedly unimpressive. Creature comforts that rivals include with base-level trims are missing here, while the options list is too crammed with items that really should come as standard. Cruise control and climate control are standard right throughout the range, but rear electric windows are bizarrely unavailable unless you opt for the range-topper. If you crave the latest technology, you might want to snap up the TechLine spec. Although not cheap, it grants you a DAB digital radio, sat-nav and twin-zone climate control. Prices start out from around £16,500 and rise to almost £29,000. Should you prefer to lease it over three years on a Contract Hire, you’d be looking at paying somewhere in the region between £157 – £340 + VAT. Running costs overall are not hugely impressive. A case in point is the most frugal petrol engine in the range, which is actually less efficient than the most expensive-to-run petrol in the VW Golf’s line-up. The 1.6-litre diesel offers a bit of relief, and can return over 60mpg and is free to tax. Apart from this unit, none of the others are exactly cheap to run, especially when compared to other cars in this sector. How much you pay for insurance will depend on the trim you go for, but it’s worth knowing that fitting your Astra with an automatic ‘box won’t affect your insurance group. Generally, the car sits in the same groups as rivals such as the VW Golf Estate and the SEAT Leon ST. Remember your first day at school? Your mum combed your hair, made sure your tie was straight, and got you to tuck in your shirt. You looked unbelievably smart and eager to please teacher. You looked as though butter wouldn’t melt in your mouth. This is how the Vauxhall Astra Estate looks from the front. Although it’s a large car, it sports a cheery, charming and friendly face that is easy on the eye and is exactly how you want a big family car to look. It’s clear that Vauxhall have devoted a significant amount of their time getting the ride quality right here. It’s not as engaging as the Focus Estate, but few – if any – cars in this class are. Instead, the ride is smooth, relaxing and super comfortable. The Astra Sports Tourer makes for a pleasant companion on those longer journeys. No, it isn’t the most practical car in its class, but for some of you operating in this price range, it’s probably going to do all that you need. Its boot is larger than some of its rivals, while space is overall impressive. There are also lots of useful storage spaces here and there, while there is more headroom than in the hatchback. Vauxhall have really missed a trick here. 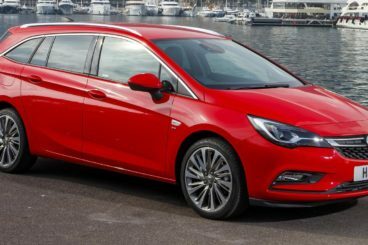 Whereas their rivals are working hard on bolstering their range of engines, Vauxhall seemed to have carelessly left this super important aspect to the last minute – and then made a raft of mistakes. The petrol range lacks any kind of power, while the diesel line-up is let down by intrusive engine noise. Whichever diesel engine you pick, you will notice a rattle and a din that is unsettling and unpleasant. There are variations in tone and noise levels, but all diesels are an issue. This is again another rookie mistake from Vauxhall. Whereas its key rivals have toned down their dashboard’s and made them easy on the eye, Vauxhall have stuck to their guns and unleash yet another busy dashboard on unsuspecting drivers. It’s distracting and does the car little favours. 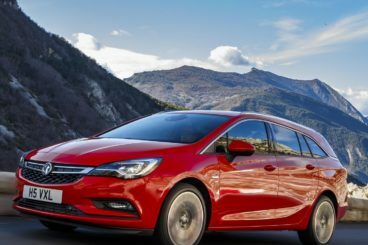 If you’re still in two minds, let’s take a look at what alternatives are out there in the comparison section of our Vauxhall Astra Sports Tourer Estate review. 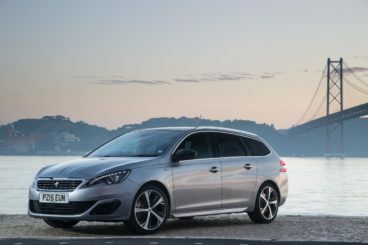 The Peugeot 308 hatchback was well revived, but how does the Estate variant fare? It’s considerably lengthier than the hatch, and has more head and leg room inside – but not a great deal more. Interior room is a bit of a bugbear here, while some of the practical touches lack basic intelligence. For example, the fuse box is inside the glovebox for right-hand-drive models, which makes this storage space pretty much useless. The Astra is more accommodating to its passengers, but the 308 SW Estate has a bigger boot. Measuring 660-litres, it’s got one of the largest luggage capacities in this class, and it can be extended to a whopping 1,775-litres with the rear seats folded down. Both cars look smart, though the Peugeot has a more polished, mature look. In terms of drivability, the Peugeot Estate puts comfort and practicality before entertainment, but it does have an unnerving amount of body lean in bends, while the manual ‘boxes are unrewarding. Regarding drivability, it’s one of the poorest in this sector, but it’s dirt cheap to run, with the most efficient engine in the range returning an astonishing 88.3mpg. The Peugeot is up against some tough rivals in this sector, but when pitted against the Vauxhall, there isn’t much between the two, although the Peugeot just about edges things. 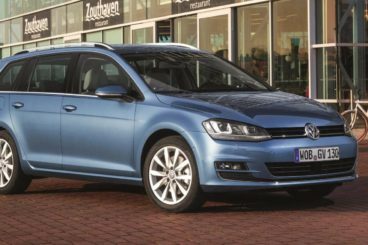 The Volkswagen Golf Estate is a bit of an all-rounder that is tough to beat on style, interior quality and price. There is no doubt that the Volkswagen is better built and sports a smarter style both inside and out, but the Astra isn’t a million miles behind and can boast a solid interior that is composed of good fit and finish. But whereas Vauxhall have held some of their budget back, VW have gone all out to give their Golf Estate a truly upmarket feel. There is a bit more bounce behind the wheel in the Golf these days, but its handling is still far from being class-leading. Like the Astra, it puts comfort before entertainment, but it has better engines to choose from. 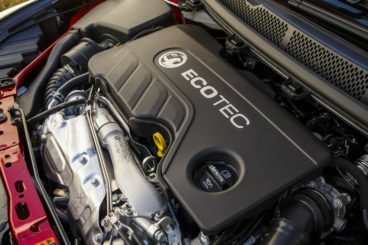 The powerful GTD diesel unit is rapid and can get you from rest to 62mph in just 7.9 seconds, while the jacked-up 1.0-litre TSI BlueMotion petrol unit is far better than any of the Astra’s petrols. And while Volkswagen might have been dogged for the past nine months by an emissions controversy, they still know how to make cars that are relatively inexpensive to run. Their worst offending petrol engine is actually cheaper to run than its most efficient counterpart in the Vauxhall Astra Estate line-up. This is despite the fact that both engines are identical in size. Vauxhall are a little guilty of committing one schoolboy error too many with this vehicle. Although it’s a solid enough car, it feels like a rushed – and in some areas even botched job, and as such it’s not going to convince all of you to give it a shot. But let’s focus on the positives: This is an affordable and practical family car from a dependable brand. It’s reliable, safe, and economical and does make a lot of sense. 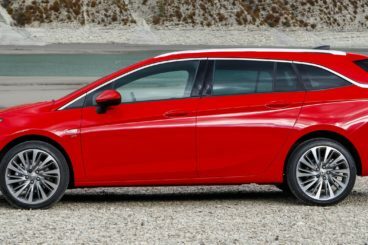 It’s got weak links but they aren’t enough to snap the chain, and if you’ve got some time to take the Vauxhall Sports Tourer Estate for a test drive, it’s worth it.